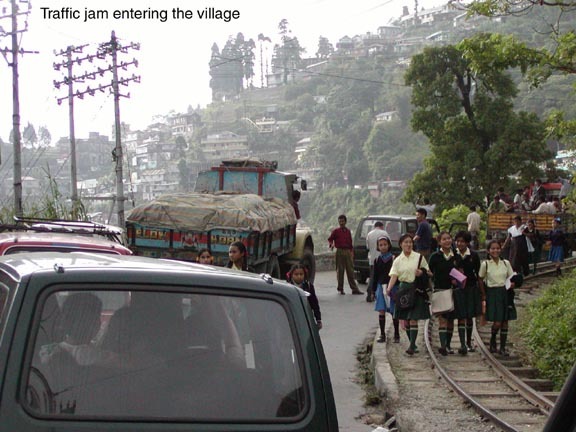 A large traffic jam has us walking 3 km up through town to a place to have tea. We have met and are now traveling with our guide and our driver. 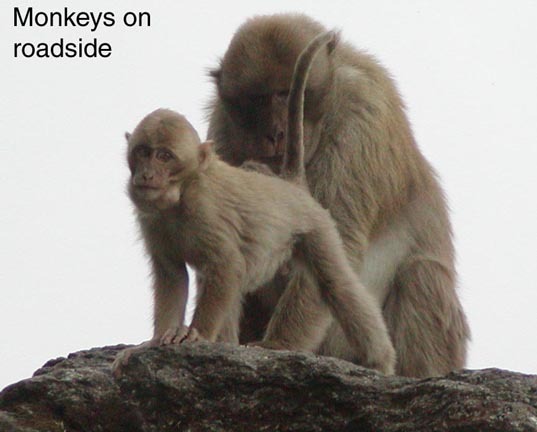 We will be with them until we reach Bhutan. Our guide is a young man named Dawa. 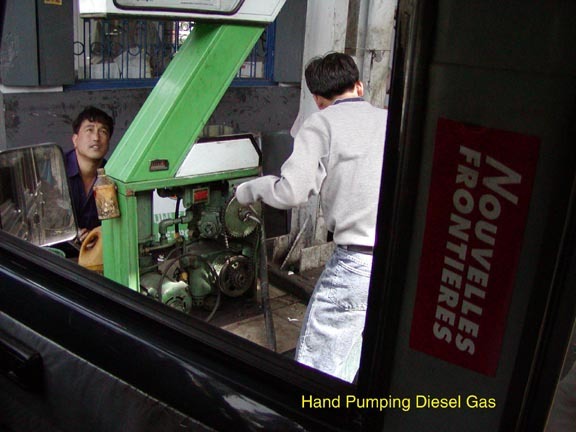 He is a graduate of the Himalayan Mountain Climbing School and has climbed to over 20,000 feet. He says we will be able to make the trek ok. The driver is Gopal. He seems very skilled. We have a good vehicle. 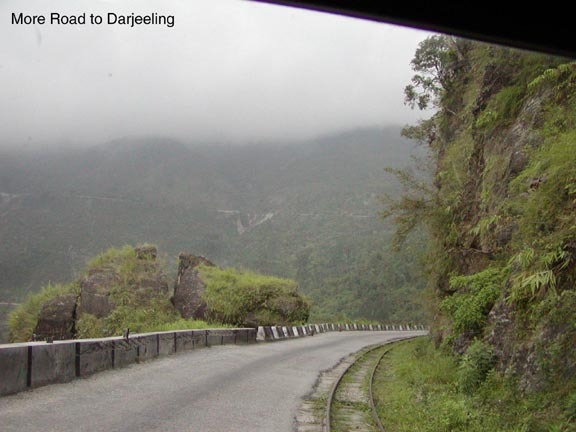 The trip from the airport at Bagdogra (Siliguri’s airport) to Darjeeling is going to be hard to describe. From the hot plains to the cool mountains. 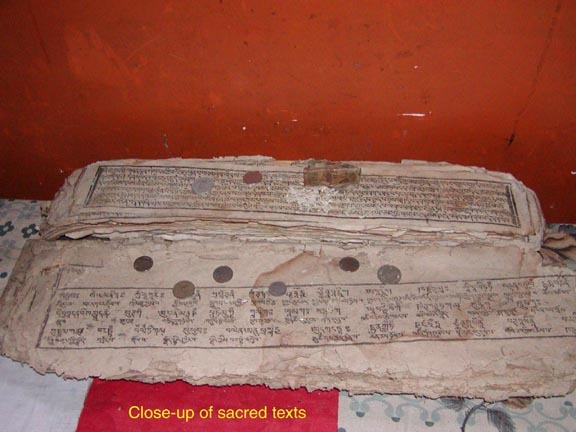 From Hindu to Buddhist. 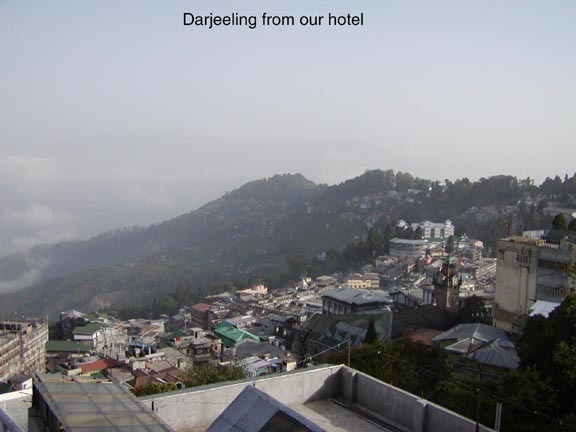 There is clearly no airport in Darjeeling. The most flat land we saw on the whole trip was a dirt undersized school football (soccer) field. Until 1880 the only way here was to mountain climb. 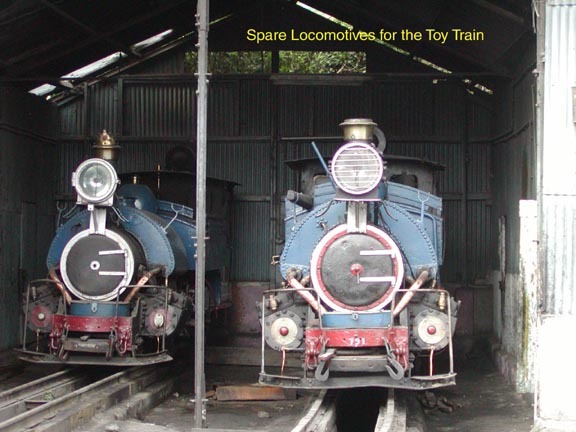 The British built a narrow track railroad at that point called the Toy railroad to get to the tea and spices in this area. 50 years later the road was added. The road is very narrow. In some places 2 vehicles cannot pass. In other places the monsoons have badly washed the road away. Nearly the whole way it was so steep there was no place for any side roads. Half way up we began to see groups of monkeys hanging out along the road. Awoke after dreaming I was teaching a professors wife the difference between living and believing in the past and future or abandoning it all for the precious moment. After meditating I realized how much I have come to like Luke, and that to go on I have to say goodbye to him. Stroking Charlottes head I see that she too must say goodbye to Charlotte to go where she is headed. I think of Rene’ Dumal’s Mt. Analog. We will soon be making decisions about what we pack and what we leave. We are already at a height where some types of thoughts are too heavy to carry. There are some thoughts that can walk to very high places. May everyone be happy. May everyone be peaceful. May everyone be free. Remember that scene near the end of one of the Star War films where Luke and princess Lea are high in a tree at night surrounded by their animal friends encampment. 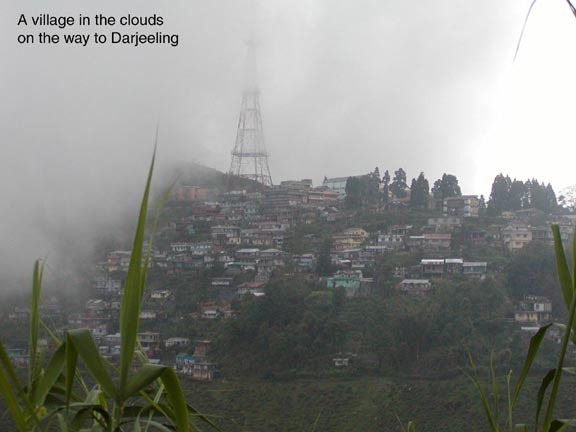 Looking out upon Darjeeling tonight is like that. We net a nice Frenchman tonight at dinner. 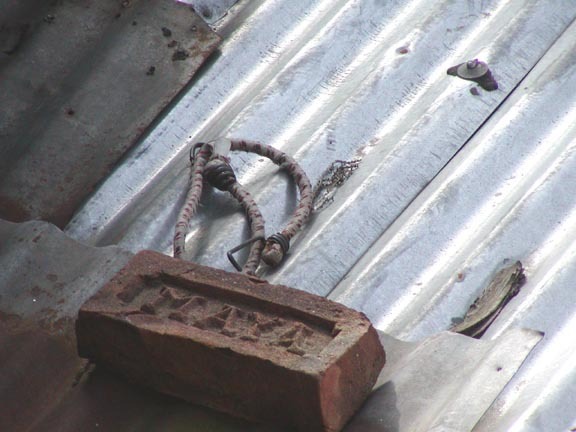 He is on his 5th trip to India – taking a break between corporate management consulting jobs. A person such as myself could probably work out an existence doing work on line. Living here can be very inexpensive. The great ticket scare. Charlotte was having anxiety this morning having not seen our return tickets for a while. I helped her tear apart both backpacks and our day pack only to find she had overlooked them in the place they were suppose to be. Can you imagine such fun? 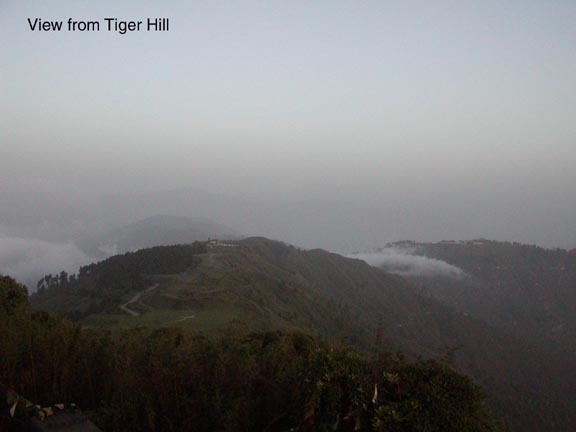 This morning we left our lodging at 4am and went to the top of Tiger Hill to watch what is sometimes a very colorful sunrise and also on a clear day Mt. Everest and Mt. Kanchenjunga (3rd highest) are visible. Charlotte said when she was here 22 years ago, she was one of 4 people watching sunrise from Tiger Hill. This morning I would put the count at over 4,000! We left after it was clear there would be no view of the mountains through the clouds. 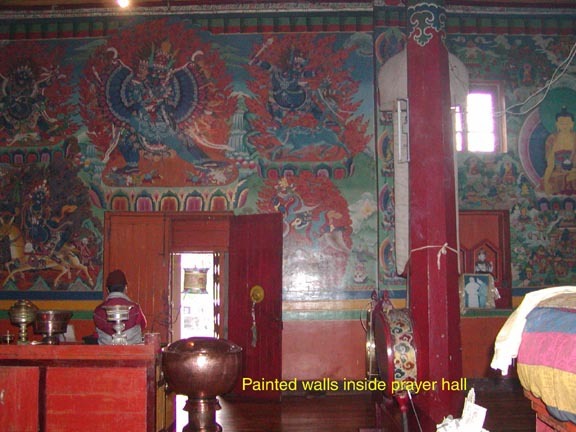 Coming back we visited our first Tibetan Buddhist Monastery. 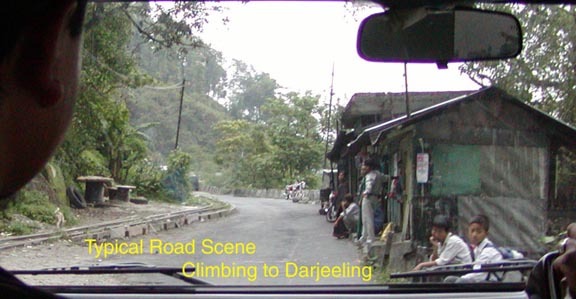 The oldest in Darjeeling. 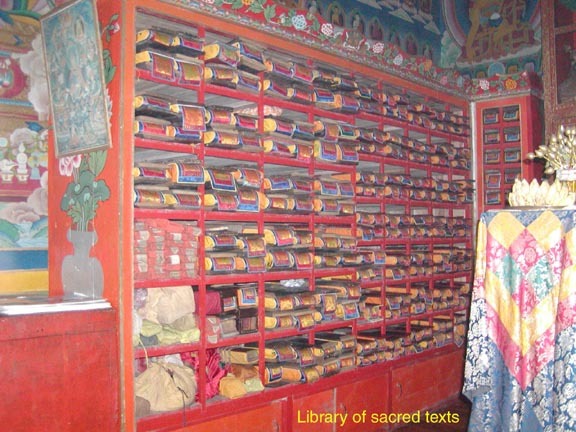 Ganden Yiga Chholling Monastery. 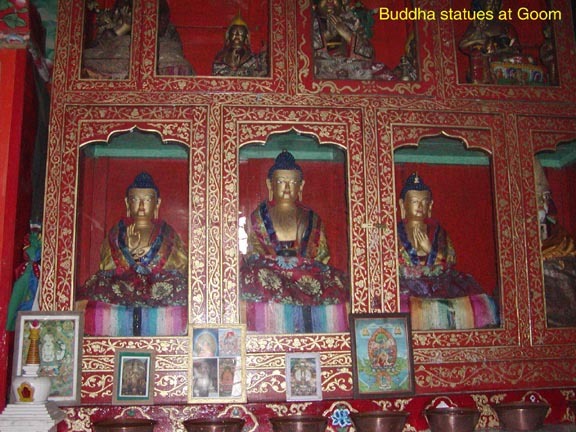 It was founded in 1850 by Llama Sharap Gyatsho, the famous astrologer of Tibet. 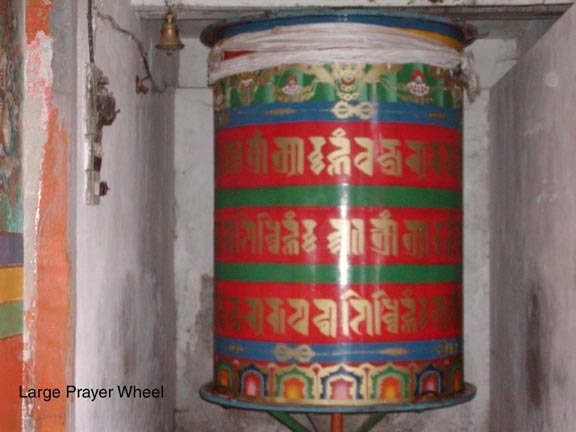 It belongs to the yellow sect of Tibetan Buddhism. 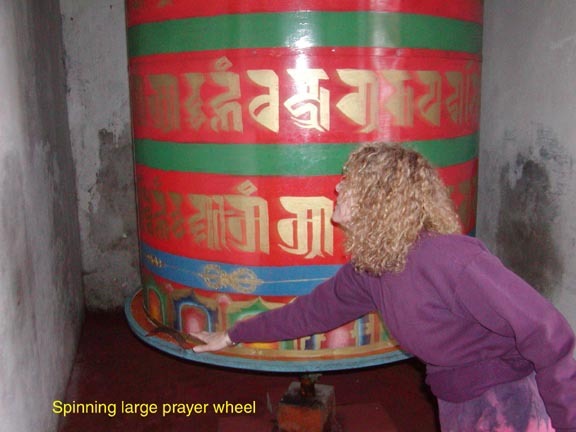 Huge prayer wheels, a great storehouse of old written teachings and a huge statue of Maitreya Buddha – the future Buddha. Dawa turns out to be a very knowledgeable Tibetan Buddhist. What a joy. 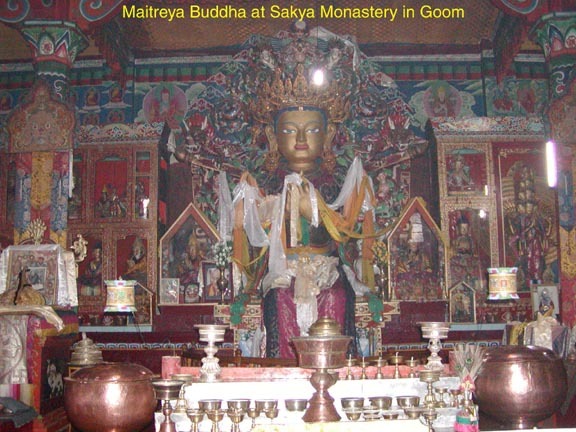 He tells us Buddhism is not so much a religion as a way of developing the mind. And what the Buddha taught was that if we practiced his method of developing the mind, we can all become enlightened Buddhas. 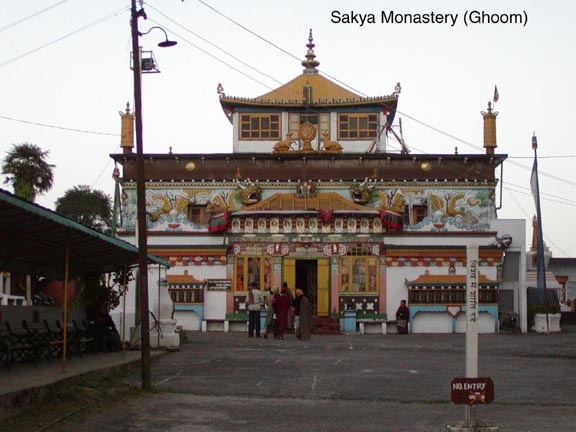 The monastery was built here because it was believed that Padmasambava traveled over this spot on his way to Tibet bringing the Buddha Dharma there. Being there, my whole body was alive in some way I had never experienced before. I doubt I will quit smiling for a long time. 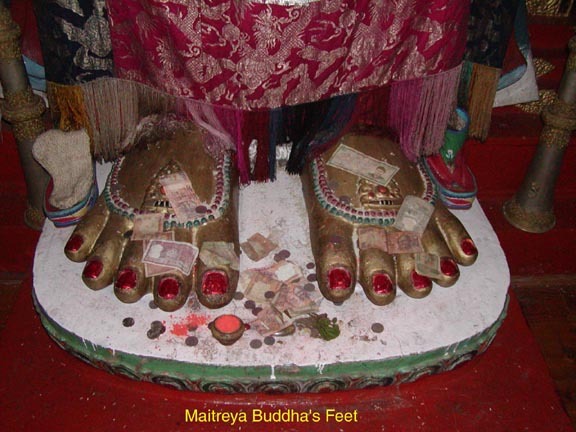 It is so amazing to feel all these Buddhist stories that read like fiction, become alive in every sense. 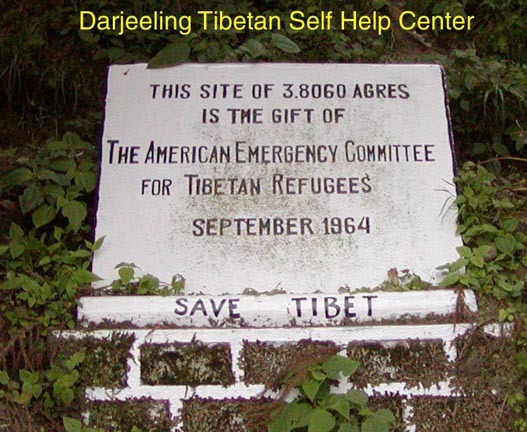 Dawa tells us his grandfather fled from Tibet. His father and he were bore here. His is 28. Charlotte finds out he is not married but has a girlfriend. And his girlfriend doesn’t work. What a pace! We have not seen another American yet. This must be the fewest Americans here since the early 60’s. 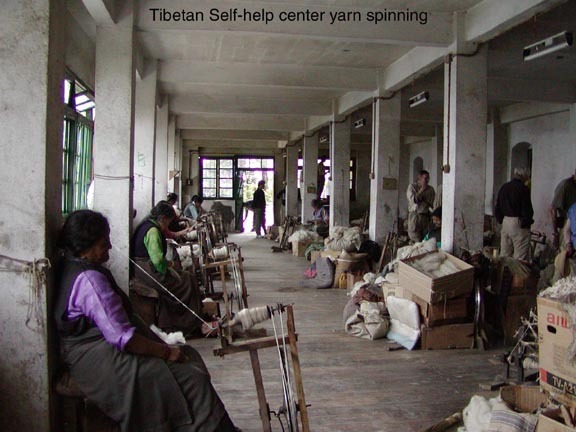 This morning we went to the Tibetan Refugee Self Help center. It was created with help from Americans. It is such a good thing, I fight back tears of emotion right now thinking about it. 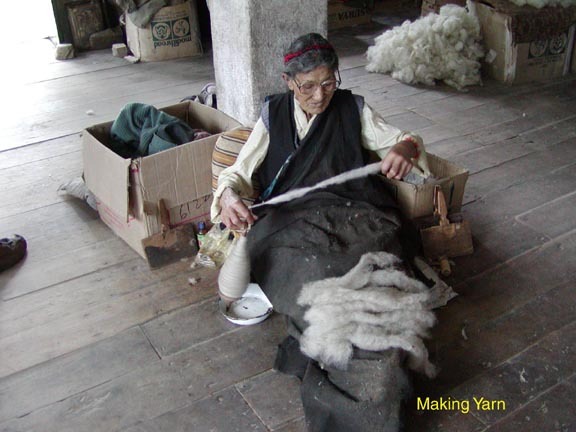 We saw Tibetans creating wool yarn, paintings, wood sculpture, sewn items, carpets and many other crafts. We commissioned a special 3’ x 6’ rug (wall ornament). It will have a large green endless knot on a beige background and a brown pattern border. It cost $290 and should arrive by November. It was a wonderful way to support them. 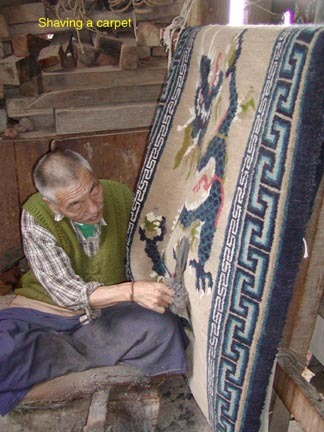 Check out their web site at www.tibetan-carpets.com . While waiting for the Visa card to clear, the shop clerks learned I had computer skills and asked me to get the games back on the computer. 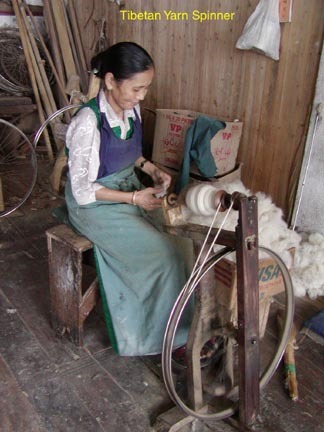 I was able to do it and their cheers of joy were very rewarding. I wrote the instructions for them to bring the games back in the future. We’ve had about a hour’s rest now, I’m still very tired. I have yet to tell about the native animal zoological site, the Himalayan Mountaineering Institute and the Happy Valley Tea Company tour. One thing I can say is everything is very much uphill or very much downhill. Himalayan wolfs, Yaks, tigers of all kinds, black bear, red panda, snow leopard, barking and other deer, cloud leopard, pheasants and other animals were all seen in the zoological center. 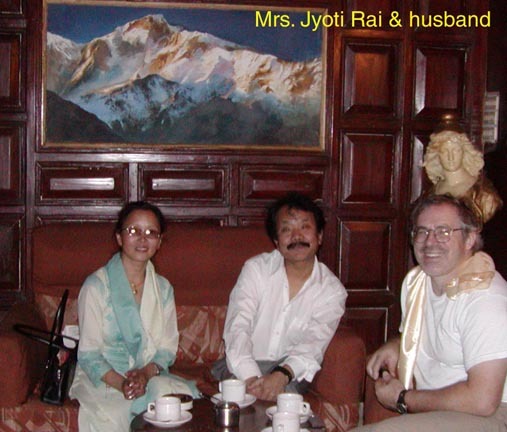 The Himalayan Mountaineering Institute had great exhibits of all the worlds great climbers. A 3-d relief of the Himalayas was really impressive. This is absolutely rough terrain we are headed into. The great climbers of the 50’s had such heavy equipment to carry. 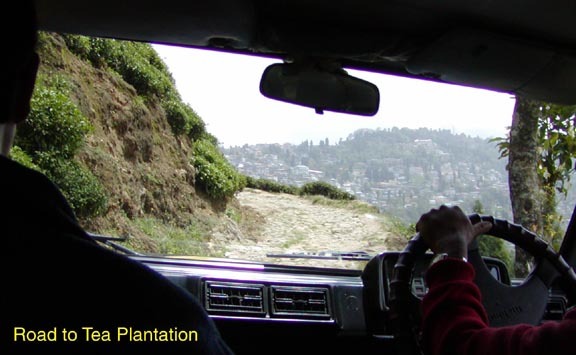 At the tea company we saw the whole process from picking to final drying and grading. 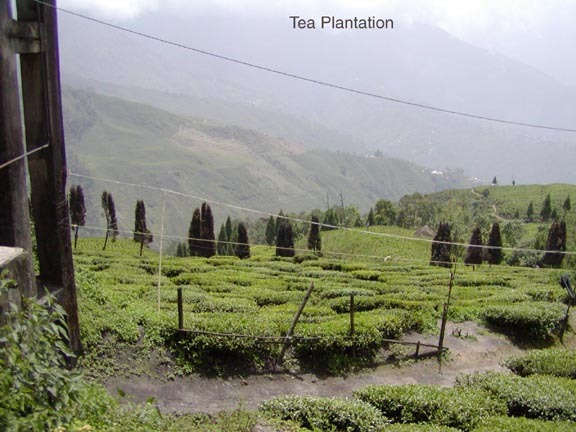 A huge forest was cut to make room for all the tea plants, but it is their biggest industry here. After all the walking today, I lost my appetite. An unpleasant reality is that my intestines are running looser and looser. Charlotte, Dawa and I shared a beer late today. Their bottled beer is twice as big as ours. 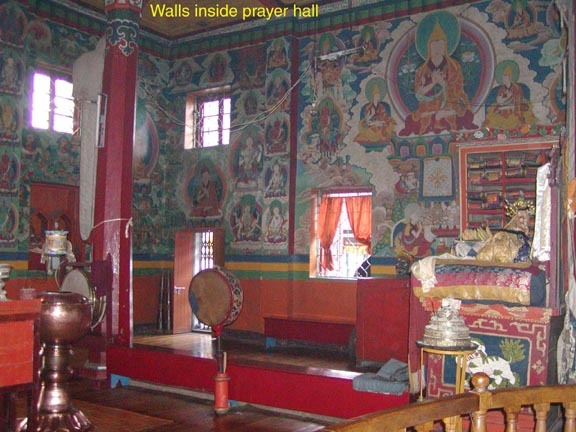 We had a short nap now, then we go to pay for our Sikkim tour and trekking. We will also try to catch up on the internet and email. A strong wind has picked up the last couple hours and we see it raining much further down the mountain. After waking I had no appetite for food. I went to the dining room with Charlotte but could only eat a piece of toast and some cucumber. 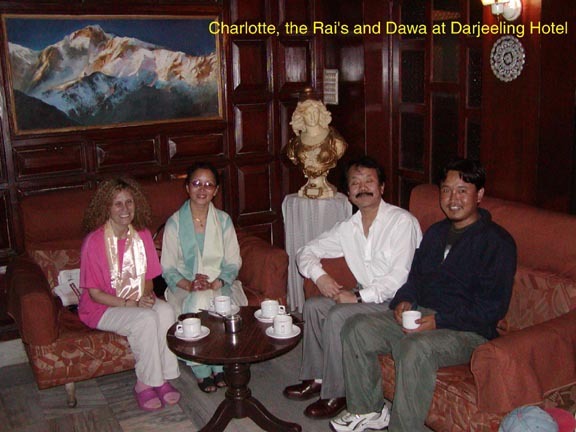 We met with the travel agents and paid them $1,970 for the trek and Sikkim tour. We went down to the market. Charlotte wore her jeans with the new custom made Darjeeling patch. Since the power was off in half the town due to the high winds, we found a cybercafe in a part of town with power. The connection was a slow 23k. We got AOL email done, but could not get gotomypc.com to work. Last night was an adventure with the toilet. We met at least a half dozen times. Now it’s morning and I think I’m empty. Next we need to pack in our backpack what we will carry on the trek and leave the rest at the travel office for the driver to bring to us later.